I’m still painting exclusively with a palette knife, learning the technique of managing control of the paint. I’m also getting paintings ready for the pre-exhibition of the San Luis Obispo Plein Air event. This reference photo is a favorite–I can’t wait to paint this spot plein air, it’s at Avila Beach in SLO County. 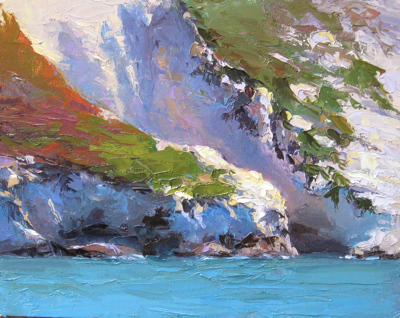 It has many of the subjects I like to paint in a seascape: ice plant, white bluffs, interesting shadow colors (the warm reflected light in the bluff shadow was a blast to paint).